Robust, practical and built for comfort, the Orthopaedica seating collection is designed to offer maximum support in the most demanding work situations. Orthopaedica assists in reducing back discomfort and enhances well being to enable the user to work and perform to their best ability. Clearly labelled and easily accessible controls allow the chairs to be adjusted if required and used by different people, without impairing their effectiveness. The 100Series offers a wider back for a more encompassing sit. The upholstered outer back creates a softer aesthetic and can be specified in two-tone fabric to create a unique look. The addition of an adjustable headrest makes the Orthopaedica 100Series a truly adaptable seating solution. 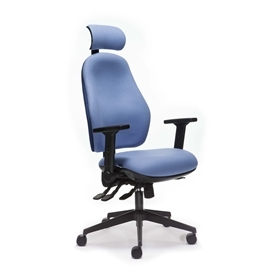 Developed to support the user in reclined positions, relieving stress and tension within the neck muscles, this model provides full ergonomic control throughout the working day. The AirTech Seat Board allows air to flow through the two way valve at a push of a button. This enables the seat to move as you move and moulds to your natural shape. A sliding seat adapts to different thigh lengths, allows the user to optimise their own comfort and support. Inflatable Lumbar and Thorax to support the areas needed. It can be inflated or deflated as required by using a pneumatic pump. Independent movement enables the seat and backrest angle to be adjusted separately, with the ability to lock in a fixed position. Synchronised mechanism enables seat and backrest angle to be adjusted to required position. Fixed ration of 1:8:1 ensures correct ergonomic posture.